I’m offering up a high-res, full colour commission WITH background to one lucky person. The only caveat is that it has to be of an original comic character of YOUR creation. You may do what you wish with the image (use for promo, print, sell, etc.) , just pop me a credit when you use it. Here is a selection of pin-ups I’ve done previously to whet your appetite. On Monday the 12th of December, I shall post a poll of all the characters entered into the 1st round and will draw the commission the of character with the most votes. As part of the process of making VANGUARD, once the script is pretty much done, I move onto making small sketches of the page layouts. These are often called thumbnail sketches within the comicbook industry. 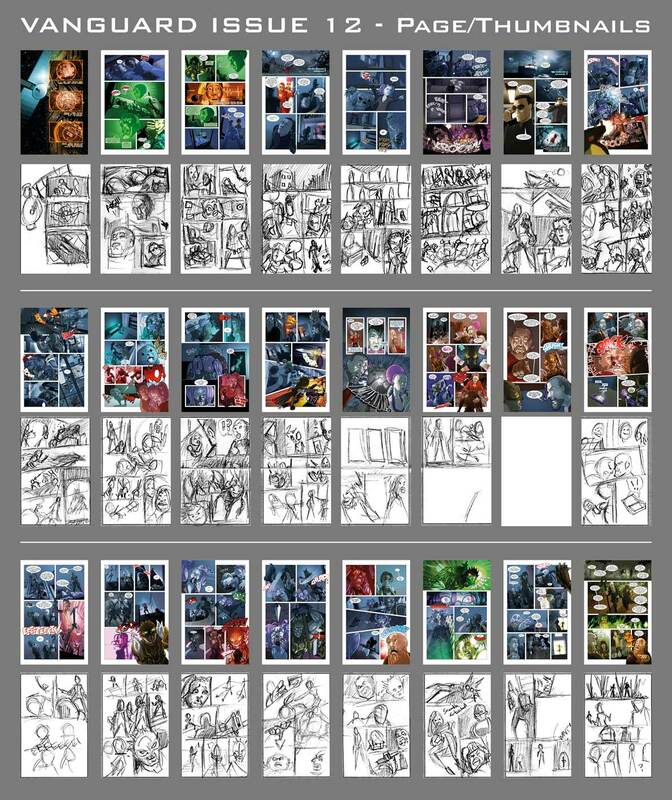 As you can see, I’m pretty faithfully to most of them, but will mix things up if it doesn’t look great on the page. I’m trying to push my layout skills and make pages more dramatic. Will try to make even more of this in issue 13, which starts in January. On the latest Awesome Comics Podcast, we recorded a special episode all about VANGUARD. In it, we discuss story, production, promotion and a slew of other topics. There’s some gems here if your make/produce your own comic. I also answer questions from readers/listeners throughout. Have a listen and if you have any follow up questions, I’ll happily answer them here. Check out more of Mathew’s work right here, as he has been killing it during Inktober! Secret Satan – Halloween 2016 Art Exchange! It Halloween! As always, we do an art swap within the Colletive of Heroes, cheekily named ‘Secret Satan’. You can check out all the entries HERE! Here the fantastic piece I revived of the original team as ZOMBIES!